Taking your own life is never the answer, no matter how desperate you are about your health. Austin Bruso learned from his own close calls and used them to fuel his break from food addiction. Morbid obesity almost cost Austin Bruso his life, but not before he was going to take it himself. At the age of 23, Bruso was weighing in at 355 pounds and 50 percent body fat. Food had been his vice since childhood—specifically fast food in large quantities. "My go-to for Taco Bell was four beef quesaritos with potatoes, 4-8 Cinnabon Delights, and two ranch Doritos Locos tacos," he says. When his doctor diagnosed him with a number of life-threatening diseases related to his weight, Bruso couldn't see a way out after so many years of food abuse and total reliance on food as a coping mechanism. Feeling totally helpless, Bruso gave in to his despair. After a failed suicide attempt, he decided to reclaim his life and make a positive change. Bruso tried therapy first. It's a life-changing tool for many who are breaking free from deep food issues, but he didn't find his freedom there. It was a single moment that gave him the power to flip the script—he pulled into a Taco Bell drive-thru and ordered only a quarter of his normal feast. "The rush of, 'Holy crap, I can do this,' was powerful in that moment," Bruso says. "For once in my life, I was proud of myself. That was one of the pivotal moments in my recovery. It changed me." Bruso capitalized on his small but profound moment. 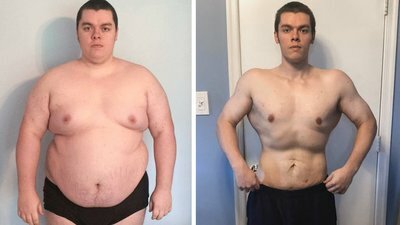 He focused on simply eating less and got down to 205 pounds in a year. "Don't convince yourself that you are destined to be imprisoned in your mind and body for life," he says. "The truth is that only you can save yourself. You just have to be willing to participate in your own rescue." Everyone's turning point will be different. For Bruso, it began with his decision to help himself. Growing up, I ate what I wanted and definitely didn't have a healthy diet. It wasn't until around age 14 that I started gaining weight, and for some reason my appetite increased significantly. Just before the transformation, I was working in the security industry, but not much else was going on for me. I felt like I was a failure at everything I had ever done up until that point. My sole source of happiness came from consuming monstrous amounts of food throughout the day. Enough to feed an entire family of four. I was living to eat instead of eating to live. Was there an aha moment for you that sparked your desire to change? On October 28, 2017, I stepped on the scale, and my weight had reached a heart-stopping high of 355 pounds. My doctor diagnosed me with fatty liver disease, acid reflux, pre-diabetes, sleep apnea, and high cholesterol and told me I was on the verge of death. Sick and tired of being sick and tired, I decided to attempt suicide. Thanks to a weapon malfunction with my rifle, I survived. I put the gun back in the case, and that was the last time I ever touched it. For my own safety, I had to sell it. I realized the transformation had to begin with my mind. I knew it was time to take massive action and change. Determined to break the cycle, I decided to attend a Food Addicts [Anonymous] meeting. At my first meeting, one by one, we introduced ourselves. It was my turn. "Hello, my name is Austin, and I am a food addict." After we introduced ourselves, the main speaker for the day gave an hourlong speech on her story. What surprised me was that you couldn't say the name of a food, you could only describe it. "It was a round, spongy food," she said. The whole thing left me struggling to contain my laughter. It crossed my mind: "How many people are successful with this?" After the meeting, I knew that wasn't going to work for me. Feeling hopeless on the way home, I needed to get my hit. Taco Bell was calling my name. I pulled into the drive-thru. My heart was racing. "Do I want to get the weight off or not?" I thought. Cars were behind me. There was no way out. "Welcome to Taco Bell. What can I get for you?" blared through the speaker. "I'll take four…wait…one beef quesarito with potatoes in it. One Doritos Locos taco, and a two-pack of Cinnamon Delights." That was significant progress for me. It felt amazing. It was truly mostly diet. Most people are shocked when I tell them how little I worked out. I spent three hours a week at the gym. But I had to break that addiction to food first. When the meetings didn't work, I had to figure out what worked on my own. I ate one meal per day most of the time and used the flexible dieting method, meaning there were no restrictions from certain food groups. My intake was never less than 2,000 calories per day, and I included multiple unrestricted cheat meals or cheat days throughout my journey. My one massive meal a day was usually chicken, pasta, and mixed vegetables. By October 27, 2018, my weight had gone down to 205 pounds, and I had gone from size 48 jeans to size 34. I finally felt free. What did your training regimen look like? I did three full-body workouts a week, with 3 sets of 10 reps for each exercise. What were your biggest motivators as you embarked on this journey? One of my biggest motivations to lose the weight was to help inspire other people who use food as their drug, to let them know they aren't alone and there is a way out. The second biggest reason was that I was tired of not being able to do "normal-sized" people stuff like fitting in a single seat on airplanes and walking without nearly passing out after a few minutes. The third reason was that I was tired of feeling alone. Losing weight has increased my confidence significantly, and that has allowed me to feel more comfortable striking up conversations with people that I run into, making it easier to make friends. What was the most challenging aspect of your journey? The mind games, constantly battling debilitating anxiety and depression. And dealing with emotional and/or binge-eating problems, as well. It's a game that I thought was damn near impossible to achieve after years of rebound diet experience. Nightly fast-food runs held me hostage for three years. It was an addiction; I'd do anything to get that next hit. The forums were a massive help. Reading some of the articles and transformation stories helped keep me on track, too. What are your future plans or goals with fitness? My purpose and mission in life has become to help people who are overweight conquer the battle in their minds and help them get into good shape by providing them with accountability, assurance, and guidance, and doing my best to keep them motivated. If you could give one piece of advice to someone aspiring to take on a major transformation like yours, what would it be? You may feel trapped, but you have to know that there is a way out. Find people who can relate to you and help keep you accountable and provide guidance. Seek help from a therapist if you need to. Don't be ashamed of it. If you struggle with your weight alongside anxiety, depression, and/or suicidal thoughts, please know that you aren't alone. Don't use food to cope with trauma. It's not the solution. When I learned that the negative feelings would subside after a while, it changed my life. It will pass. The struggle with your mind and your body is not a life sentence. If you or someone you know is having suicidal thoughts, you are not alone. Check out the National Suicide Prevention Lifeline for information, resources, and support.